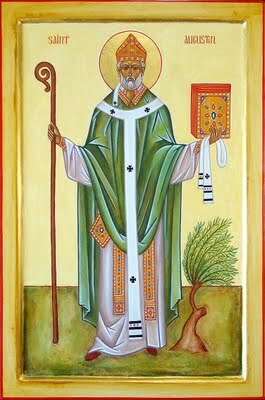 Today the Church celebrates the life of Saint Augustine, Bishop and Doctor, as in Doctor of the Church. He was certainly no doctor of biology, though the pro-abortion folks love to celebrate his primitive understanding of embryology as somehow an indication that the Church has not always condemned abortion as it does today. Sometimes, indeed, this lustful cruelty, or if you please, cruel lust, resorts to such extravagant methods as to use poisonous drugs to secure barrenness; or else, if unsuccessful in this, to destroy the conceived seed by some means previous to birth, preferring that its offspring should rather perish than receive vitality; or if it was advancing to life within the womb, should be slain before it was born. Hence in the first place arises a question about abortive conceptions, which have indeed been born in the mother’s womb, but not so born that they could be born again. For if we shall decide that these are to rise again, we cannot object to any conclusion that may be drawn in regard to those which are fully formed. Now who is there that is not rather disposed to think that unformed abortions perish, like seeds that have never fructified? But who will dare to deny, though he may not dare to affirm, that at the resurrection every defect in the form shall be supplied, and that thus the perfection which time would have brought shall not be wanting, any more than the blemishes which time did bring shall be present: so that the nature shall neither want anything suitable and in harmony with it that length of days would have added, nor be debased by the presence of anything of an opposite kind that length of days has added; but that what is not yet complete shall be completed, just as what has been injured shall be renewed. And therefore the following question may be very carefully inquired into and discussed by learned men, though I do not know whether it is in man’s power to resolve it: At what time the infant begins to live in the womb: whether life exists in a latent form before it manifests itself in the motions of the living being. To deny that the young who are cut out limb by limb from the womb, lest if they were left there dead the mother should die too, have never been alive, seems too audacious. Now, from the time that a man begins to live, from that time it is possible for him to die. And if he die, wheresoever death may overtake him, I cannot discover on what principle he can be denied an interest in the resurrection of the dead. Now who is there that is not rather disposed to think that unformed abortions perish, like seeds that have never fructified? This is a critical point for pro-life apologists. Augustine demolishes the modern abortion apologia by positing the human essence at the very earliest stages of development, clearly indicating that these human beings will not only be present on the last day, but that their bodily resurrection will be manifest in complete developmental form. It didn’t matter to Augustine whether or not the embryo is just a clump of cells. It is human, fully human if it is to appear at the resurrection of the dead. Apart from engaging in a bald-faced lie, the pro-aborts also show the illogic of their approach in trying to impute to Augustine a primitive understanding of developmental biology and concomitant lack of human attribution to that entity. If on the one hand the argument goes that spiritual matters are a function of biological knowledge (As they falsely impute to Augustine), then they have destroyed themselves in the modern era. The field of developmental biology has spoken decisively of the human identity and status of the embryo from the moment of conception. By their logic, it follows that the embryo indeed has a soul. Reaching back to a period of perceived uncertitude as a rationale for abortion is an absurdity when placed alongside the modern certitude of the embryo’s human identity and status. Priests for Life has compiled a lengthy list of early Church condemnations of abortion, beginning in the First Century. The list makes it clear that the Church has condemned abortion consistently from its very founding. Augustine was simply one in a long line of Bishops to do so.